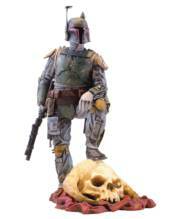 The most notorious bounty hunter in the galaxy joins Gentle Giant Ltd.'s 1:8th scale Collector's Gallery statue line! Boba Fett exudes 'dangerous and cool' as this new statue -every dent in his armor tells a story, every chip in his paint another victory for this ruthless hunter. Clad in his Empire Strikes Back-era Mandalorian armor and armed with his rifle and blaster, Fett casually rests a booted foot atop his most recent prize - a Wampa skull! Boba Fett is the fifth statue in Gentle Giant's new 1:8th Collector's Gallery line, and fourth in their 'Bounty Hunter' series. Each limited edition Boba Fett statue is hand-painted and cast in high-quality polyresin with crisp details such as his range finder, rocket pack, and actual braided Wookie scalps. This statue comes individually numbered with a matching certificate of authenticity.